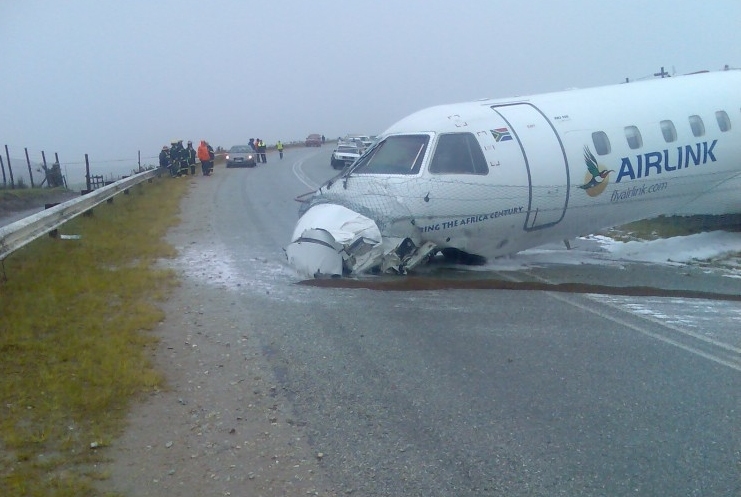 The runway excursion accident involving an Airlink (South Africa) Embraer RJ135LR passenger jet in Decemer 2009 was caused by aquaplaning due to poor runway friction, according to the second interim report published by the South African Civil Aviation Authority (CAA). SA Airlink flight SA 8625 departed Cape Town International Airport (CPT) on a domestic scheduled flight to George Airport (GRJ). The aircraft was cleared for an instrument landing system (ILS) approach runway 11. The prevailing weather conditions at the time were overcast in light rain. The aircraft touched down in the area of the fourth landing marker. At the end of the runway veered to the right and went past the ILS localizer. The aircraft collided with eleven approach lights before it burst through the aerodrome perimeter fence, with the aircraft coming to rest in a nose down attitude on a public road. Runway 11 is a 2000 x 45 meters asphalt runway. At the time of this accident it was the first time that the George area had received a proper rain shower following the rehabilitation of the runway, which was concluded on 6 November 2009. It would appear that the application of the fog spray sealant extensively used during the runway rehabilitation works degraded the surface friction coefficient of the runway surface during wet conditions. This allowed the onset of aquaplaning and thereby inhibited the application of adequate braking pressure by the anti-skid system to stop the aircraft within the certificated distance.